“Panet of Whispers.” Never mind. I’ll just squeeze that “L” in. Dang, B’mancer beat me to it. I was going to propose a single letter seeks good counter tag. They appear to live in that giant metal tube or canister. This is either a Chinese Whispers version of the 80s ‘Beauty and the Beast’ TV series or, and I hate myself for thinking this or using this combination of words, ‘Top Cat’ slash. 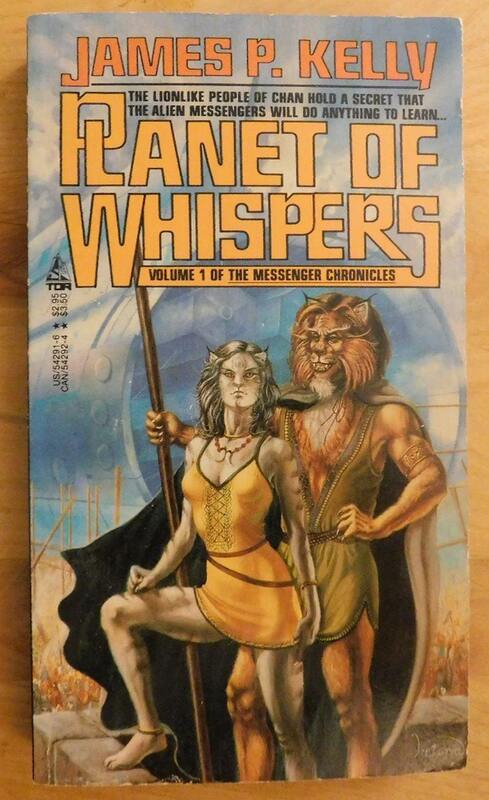 No dammit, it’s “Planet of Whisperers”! Always with the cat people. Where’s the book about a planet ruled by dog people? The secret is they are peoplelike lions and not lionlike people. There’s only one way to account for Leo’s rather sharp (and somewhat smug) intake of breath—she’s leaning that left shoulder just far enough back. I have to say, I don’t think catperson fashion models have ever appeared on this site before. She has…..something……. in her left hand. Only a staff for protection ? No gold dagger,No silver ray gun ? Is that the secret ? @Bibliomancer. I don’t know what you’re talking about. We haven’t had any cat people for (just) over a week. I was beginning to think something was wrong! Cats have no respect for personal space. The same is true for cat people. Cat-woman is ready to leap off the battlements to get away from Rum Tum Tugger. Why all the complaining? This cover is PURR-fect! What with Rule 34, it’s a wonder cat people don’t have the catly appropriate 6 dumplings. I guess that’s to even out the lizard people having any? She’s about to apply her claws to delicate parts of his anatomy. They seem to be standing atop a tower made of cinder blocks, with a whole bunch of other cat people jammed into a crowd behind them. The metal cylinder appears to have nothing to do with the cats, they’re just milling around it. @Anna T: Who better to be on a catwalk? @A.R.Y. – Whichever. Time to tag a Smirky McSmug. She’s got that look on her face because his Tinder profile picture was this. “Smirky McSmug” really fits here. Even with a face covered with and surrounded by fur, he manages to really convey ultimate smugness. Not sure why — it doesn’t look like that catwoman model is going to give him anything other than an elbow to the ribs and possibly a claw to the goolies. @GssXN—it must be me then, not that I’m paranoid or anything . . . .
@DSWBT (27)—well, your no schnorrer. The Holy Blood & the Holy Grail of Narnia. @BC: no, it is spelled ‘schnorrer’. Source: Wikipaedia. @Tag Wiz—point taken. Please note though that the pec badgering has stopped. However, there’s always my “face in tree” obsession liable to pop up at any moment. A schnorrer is a schnorrer is a schnorrer, of which you are not. @BC – But face tree already exists! What do you want next? A “tree-in-face” tag? @Tag W—Hmmmm, “tree in face,” not a bad idea. I’ll bet Bibliomancer , with his massive knowledge of Chinese GSS, could dig one up. By the way, thank you for the true tagging wizardry you bring to the “real” GSS—no sarcasm. Nice to see the Thundercats still getting work.